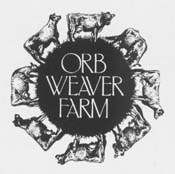 When farmers use milk exclusively from their own cows to make cheese, it’s called “farmhouse cheese.” That’s what we’ ve been doing at Orb Weaver Farm since 1982. We milk our Jersey cows to make rich, raw milk cheese with a slightly tangy, full bodied flavor. More moist than cheddar, Vermont Farmhouse Cheese has a natural buttery color and smooth, creamy texture. It is delicious off the wheel with wine, melts beautifully to complement any recipe, brings grilled cheese sandwiches to new heights, and distinctively tops nachos and pizza. Our two-pound waxed and cave aged wheels also make elegant gifts that are easy to mail. In 2001, we took a new step into an age-old tradition and began making cave-aged cheese. Using stones from neighboring Panton, VT, we built a cave in a small hillside on our farm to replicate as closely as possible the aging process used for centuries before refrigeration. Cave conditions are warmer and more humid than those for our standard farmhouse cheese, and the aging cycle is longer – up to a year for a 10-pound wheel. We don’t wax cave-aged cheese, but instead turn and brush the wheels every other day for several months, creating a natural rind. The end result is heaven for cheese lovers: a robust, complex array of nutty, earthy flavors and a firm, slightly drier texture that makes our cave-aged cheese a true delicacy. Cave-aged cheese may require more time and TLC, but we think you’ll agree the results are more than worth it. In our experience, Jerseys give the highest quality milk for cheesemaking, with more butterfat, protein and vitamins than milk from other breeds. Because we care for our own Jerseys, we know we’re always using the purest, most nutritious milk possible for fine-quality farmhouse and cave-aged cheeses. We feed our cows sweet-tasting, sweet-smelling grain and organic hay to produce the most savory milk That’s one of the reasons we won an award for the best-tasting milk in Vermont. For cheese, we milk a small family of seven Jerseys – Orbit, Lassie, Frolic, Guffo, Miso, Cocoa and Ozzie. Happy cows make the best milk, and so our Jerseys enjoy the sounds of classical music whenever they’re not rotationally grazing 30 acres of clover pasture. We make our cheeses simply, in the European tradition. We stir, form, and date-stamp each wheel by hand – we don’t use mechanical stirrers or hydraulic presses. Our wheels age from 6 to 12 months and, since we do everything ourselves, quantities are limited. We make cheese from November through May. We give our cows, and ourselves, a break every summer while we tend our organic gardens. We’ve been practicing sustainable farming since we began in 1982. We cultivate our organic gardens and sell the produce to local restaurants and markets. We compost all our culled vegetables, cow manure, and whey (a byproduct of making cheese) and eventually return their nutrients to the gardens and pastures. We love our farm in Vermont’s beautiful Champlain Valley. During an era when family farms are quickly disappearing, we feel blessed that our small farm is thriving. A natural rind , a robust, complex array of nutty, earthy flavors, and a firm, slightly drier texture. This versatile ( waxed ) cheese has a smooth, creamy taste, & melts beautifully to compliment any recipe.